Barbecue Beef Sandwiches – What's for Dinner Moms? I still have quite a bit of ground beef leftover from last month. I buy 20-30 lbs. of meat at a time when it is a really good sale but at the same time it needs to be used before it goes bad so I make sure I rotate my meats freshest on the bottom. That is bringing lots of chicken breasts and ground beef to the top. I am looking for lots of different ways to use ground beef and this is one of the ways that is very tasty. 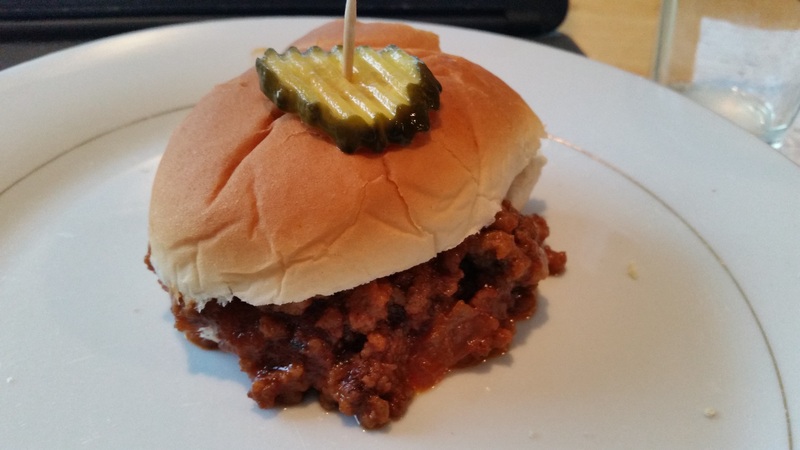 It is similar to sloppy joes but more savory than sweet with the vinegar flavor being the stand out. My family loved this dish but I also have a child that would drink vinegar straight from the bottle if I let her. This has a more savory vinegar taste than most sloppy joes, which we liked. If you don’t want that to be the flavor you want start with less vinegar and taste and adjust the recipe as you go. Remember to make it into something you and your family would like. In a large skillet over medium heat cook onion and ground beef breaking the beef up into tiny pieces as it cooks. In a bowl mix together ketchup, vinegar, lemon juice, Worcester Sauce, brown sugar, garlic powder, salt, and pepper. Taste and adjust spices as necessary. Once ground beef has cooked mix ketchup, ground beef, and beef stock together in the skillet. Cook until mixture has reduced approximately 30-40 minutes. Stir occasionally. Serve on top of hamburger buns (toasted if preferred) topped with pickles, if desired. I love the vinegary taste! This recipe sounds really delicious, Marci. Thank you so much! How are you doing? I am doing really well, thanks Marci. Baking up a storm. yumm I love sloppy joes and this looks delicious! Thanks, Lynn! I live that savory, vinegary taste. Yum! Printing and saving this recipe, Marci! Thank you, Sylvester! I hope you like it. You’re welcome! I always enjoy some good bbq! Thank you! Glad you liked it and made it your own!